Looking at reviews and opinions of Brotherhood of the Wolf (directed by Christophe Gans, 2001), you discover a general consensus that the film is a mess (or, to put it more sympathetically, "eclectic"). David Edelstein expresses this opinion by listing an armament of movies that seem to have inspired it: "The movie is a teeming mixture of The Curse of the Werewolf and Cry of the Banshee and Jaws and Sleepy Hollow and A Fistful of Dollars and Let Joy Reign Supreme and The Name of the Rose and Fists of Fury and Mad Max and Once Upon a Time in China II and The Last of the Mohicans and The Hound of the Baskervilles and maybe a thousand other pictures that rumble around in the collective unconscious of schlock fiends." Scott Hunter, in a slightly less receptive review, puts it thusly: "Certainly the loopiest thing that's come along in many a fair year, 'Wolf' is a mad agglomeration of styles and traditions that ultimately results in nothing so much as a mad agglomeration of styles and traditions. Nothing in it really connects with anything else." These reviewers see this as something to snark at, indicating a deep-seated confusion within the film. Even Ebert, whose review is notably more positive, seems to see it as a triumph of chaos: "The Brotherhood of the Wolf plays like an explosion at the genre factory. When the smoke clears, a rough beast lurches forth, its parts cobbled together from a dozen movies." The reviews all scream "Entertainment! ", urging us to forget the goofy anachronisms and campy dialogue, and to forgive what seems like a total breakdown of coherence, abandoned in favor of the filmmaker's fancy. And yes, on this level, it's already a fun film. However, forgiveness goes hand in hand with dismissal, and as far as I can tell, all the reviewers have dismissed any search for a unifying principle to Brotherhood's form. But it's there... if you step back a level and consider all the motivating elements of Brotherhood's plot and style, you'll find an undeniable formal reference that justifies the cross-pollination of all these random elements: the swashbuckling, the supernatural horror, the mystery, the court intrigue, the colonial-era exoticism. I'm not talking about your local teenager's "gothic," with the black eyeliner and the skateboarding. I'm talking about that genre of dark romance fiction that rose to prominence in the mid-1700's and declined by the mid-1800's, with Charles Maturin's Melmoth the Wanderer often considered its apex. The gothic genre morphed into classic horror and "tales of the Weird" during the Victorian era, which is when you started seeing more urban settings: Edgar Allen Poe, Sheridan Le Fanu, and old Bram Stoker are the better-known of this later, more familiar gothic literature. Brotherhood of the Wolf bears more resemblance to the proto-Victorian gothic tradition, which was less gritty and more fanciful and romantic: Ann Radcliffe, Mary Shelley, and the aforementioned Charles Maturin are all worthy reference points for a study of this form. And once you're keyed into this worldly, discovery-era gothic aesthetic, with its grand adventure plotlines and dashing heroes, you'll see that Brotherhood of the Wolf, though adapted for a modern action-movie audience, is actually one of the most faithful adaptations of this style ever put to screen. Honestly, it's a hard style to adapt... it set the stage for horror, with its unspoken spiritual threats and transgressions of conventional norms, but it didn't have a lot of the horror tropes that have become so standard. There were no scrambling pursuits through the mud or tiny, secluded, hermetically-sealed spaces, like basements or back rooms; indeed, in the gothic novel, the world always seemed vast and wild and unexplored, and most of the chases were on horseback, in the shadows of forbidden castles. There were far fewer themes of bodily violation, and more of spiritual and mental perversion. Hopelessness and nihilism weren't pervasive; rather, the horror was interspersed with romance and adventure, and there was a frequent sense of heroism and redemption, all but vanished from modern horror. Brotherhood of the Wolf is told within a framing narrative, transcribed during an old aristocrat's last moments before his submission to the mercy of a mob of revolutionaries. This, already, is an obvious indicator of the gothic nature of the tale. Melmoth the Wanderer was a baroque construction of nested stories, often told or written in the final hours of the narrator's life or sanity. It's a well-established genre convention that's been kept alive through the history of horror, recognizable even in the 20th-century stories of H.P. Lovecraft and Thomas Ligotti. Many more motifs and tropes appear in Brotherhood of the Wolf that we find echoed from the classic adventures. Fronsac, the protagonist, is the epitome of the swashbuckling hero, complete with the explorer avocation "naturalist," an indirect reference to so many adventuring doctors from those classic stories: Bram Stoker's Van Helsing, Sheridan Le Fanu's Dr Hesselius. These guys all seemed to be jacks of all trades, ready to go on adventures and track evil to its source; Fronsac is not unique in his ability to fight off ruffians and do taxidermy, though he may be a little more exaggerated than the Gothic gentlemen of old (with his expert martial-arts swordsmanship and all). Le Fanu's work is definitely worth comparison, along with Mary Shelley's... these authors, along with many others, were instrumental in rationalizing the occult, treating supernatural phenomenon as natural science and vice versa. Brotherhood of the Wolf certainly inherits from this tradition, being the ostensible "explanation" story of an infamous folk mystery (The Beast of Gévaudan, a classic cryptozoologic case). 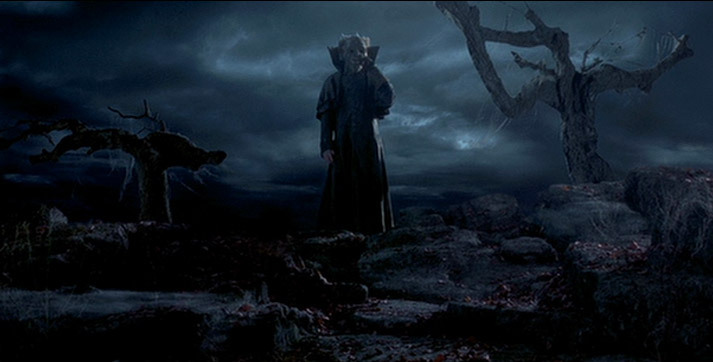 Superficially, the film seems to side with Fronsac, the skeptic, who demands a reasonable explanation for this supernatural phenomenon; yet, Brotherhood subverts its own lesson, allowing side-kick Mani to use his Native American pantheism as a way of collaborating with wolves and trees and the dead. Gans treats one wolf as a totemic spiritual guide (Three Wolf Moon! ), and he allows spirits to speak and prophecize in dreams. As with Fanu, who systematizes the irrational as a way of enshrining its enigmas, Gans sides with rationalism and naturalism, while allowing the inexplicable to come into relief beside it. What else? How about Mani, the Mohawk Indian blood-brother to Fronsac? He represents a motif that appeared in gothic fiction, as well, though not as consistently as the previous ones: the noble savage. Maturin also had a lengthy episode about an innocent uncivilized character, written to shed light on the moral complications of social and political man. This character, and the Spanish Jew who provides refuge to one of the novel's protagonists, demonstrate Maturin's fascination with the exotic, a role filled by Mani the Native American and Sylvia the Italian prostitute in Brotherhood of the Wolf. These characters give Gans' world a sense of expansion and uncertainty, of vastness and rumor and geographical fluctuation, truly an accomplishment, considering it was filmed at the height of 21st-century globalization. And let's not forget the antagonist, the closest thing we can get nowadays to a moustache-twirling melodramatic villain. In classic romantic fiction, the villain is always a charismatic lord, transparently evil to the audience but inexplicably opaque to his fellow characters. He tends to wear some badge of villainy, and for Jean-Francois, this is the missing arm, later revealed to be concealed and mutilated into a sort of devil's claw. His alarming combination of political savvy, combat proficiency, and sexual perversion, kept under wraps until late in the story, make Jean-Francois the epitome of an aristocratic devil, even to the point of his leading a cult meeting at a caern in the French countryside. Of course, Brotherhood of the Wolf reaches at least a bit beyond its genre referent. The martial arts are an absurd anachronism, but they serve a purpose in this elaborate referential structure. They are the credentials of the new global adventurer, shorthand for single combat in the modern world... the martial arts face-off is the new equivalent to the duel of sabers or the barroom brawl. Is this necessary? Not technically, but perhaps thematically. After all, of all the genre cliches, fencing and fisticuffs have become some of the most associated with camp and Disney fairy-tale fantasy. When we're seeing a face-off between martial artists, we're still able to take it seriously and accept it as an actual form of violence, though just barely. It also plays into the "exoticism" motif that feeds so much of Brotherhood's aesthetic and atmosphere. As a modernization of an adventure convention, it's definitely covered under Gans's artistic license. I've addressed some specific conventions that relate Brotherhood of the Wolf to the classic Gothic horror novel. If I had more experience with the genres, I'd find a deeper way to connect this film's structure to those old stories. It is, after all, a canvas of political history, social and aristocratic conspiracy, and partially-debunked supernatural anecdote. One-hundred forty minutes starts to seem rather short when you consider that Gans wove together messages about aristocratic France, the peasantry, social politics, and the birth of rationalism in the age of exploration. There's also significant subtext about motivated messaging and sensationalism in one of the earlier periods of "mass media" (indicated by an early discussion of the availability of newspapers). But as I said before, this baroque architecture of themes and messages isn't unprecedented: already, a few hundred years ago, those Gothic novels were weaving together complex messages about spiritual wholeness, aristocratic greed, religious and secular politics, and the tension between civilization and human nature. If I've encouraged any action film watchers to go out and read some of these strange old novels, I'd like to reassert that encouragement. And if (less likely) you're a Gothic horror and romance buff who's looking for a film to go along with your reading of The Mysteries of Udolpho, I'd like to urge you to see Brotherhood of the Wolf. I'd love to hear about your thoughts on this long comparison.